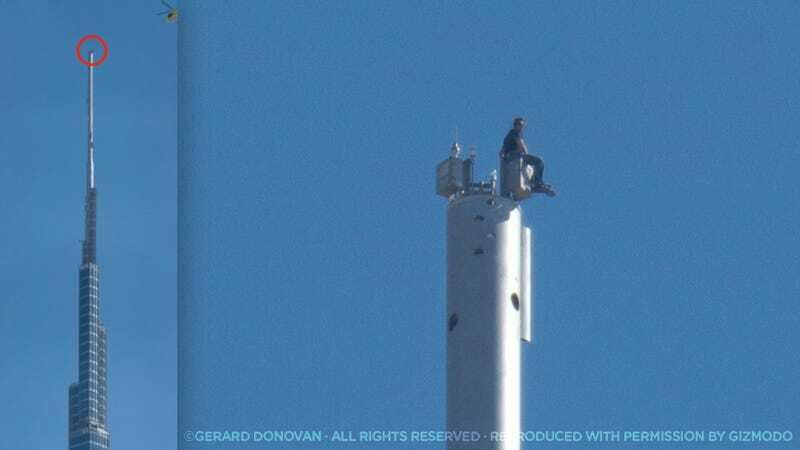 Why Is Tom Cruise Sitting On Top of the World's Tallest Building? We got photographs and video of Tom Cruise jumping off the mid-section of the tallest skyscraper in the world. But this is him on the very top of the Burj Khalifa, filmed by an helicopter, taken around 1AM New York time. He was up there for about an hour. Chopper circled several times very close. He's the only one that you can see, but on a video I have, you can see that there were other people up there but hiding down the spire. Lots and lots of filming was happening—both from the chopper and from below (check out the guy in the cradle hanging lower down the Burj on the left hand side). They were filming a 360 degree pan of him. My guess is that it's for promo, and maybe not for the film itself (in all the swinging shots he's wearing 3/4 length trousers. Here he's wearing jeans I think). 3. From there, he got elevator BS4: Level 160 to section 18B (646.9 m.) You can also take the steep stairs/landings from 160 to 18B. 5. Went from section 19 to section 21 (691.7 m.) taking the steep stairs/landings. Yes, that's 443 feet climbing up a ladder at the end. Seems like quite a trip. Cruise has been filming Mission Impossible 4 in Dubai during the last few weeks.